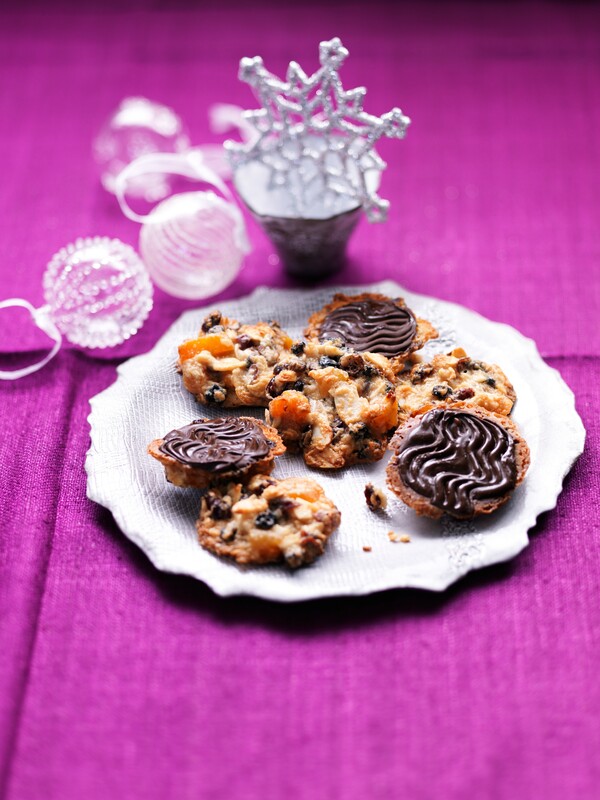 Nothing says how much you care than a homemade present – and these Florentines are so quick and easy. Make them look really professional with a celophane bag and some ribbon. 150g (5½oz) mixed dried fruit and nuts such as apricots, cranberries, blueberries, cherries, toasted flaked almonds, desiccated coconut etc. 1. Preheat the oven to 180C, (160C for fan ovens) or Gas Mark 4. 2. Melt the butter and sugar in a non-stick saucepan stirring until combined. 3. Add the condensed milk and heat until just bubbling. 4. Stir in the plain flour and mix until smooth. 5. Stir in the dried fruit and nuts. 6. Place spoonfuls of the mixture onto parchment lined baking sheets and bake for about 12 minutes until turning golden brown at the edges. 7. Leave to cool on the tray. 8. When cool, melt the chocolate and spread a small amount on the flat side of the Florentine then drag a fork through the chocolate to make wavy lines. These are so getting made (&probably eaten by me) – great idea Kate! What a great idea for a gift! I love baking so I might need to try this recipe!